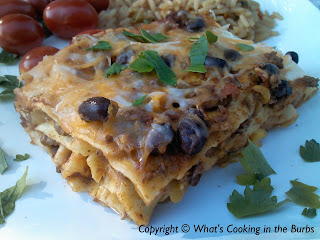 I've always loved Mexican lasagna. Normally I would make it with tortillas but I had a box of lasagna noodles in the pantry that I had to use up. I wasn't in the mood for Italian, so I decided why not make my favorite Mexican Lasagna using the noodles instead. It was actually better than my original version. A real hit! In a large skillet, brown ground beef until no longer pink in the center. Drain. Add enchilada sauce, green chile's, taco seasoning, and 1/2 cup of the salsa. Stir and place over medium high heat, stirring constantly, until bubbly, about 4-5 minutes. Remove from heat and stir in corn and black beans. Spread remaining salsa into bottom of 9x13 dish. Top with a layer of lasagna noodles.. Spread 1/2 of the filling from the skillet over the noodles. Top with half the cheese. Repeat. Cover loosely with foil and bake at 375 for 30-35 minutes, or until bubbly and pasta is tender. Allow to sit for a few minutes before cutting. Enjoy! yum! I am a sucker for lasagna! Have a happy Monday and be sure to check out my newest dress! LOVE, LOVE, LOVE this recipe! We are big enchilada junkies, so this would be perfect for us. Thanks for sharing at Simple Supper Tuesday.